If an individual has less than perfect credit and they have difficulty obtaining a traditional credit card they do have the option to get a secured credit card to help them rebuild their credit. It is no longer that easy for a new business though as most banks have stopped offering secured credit cards for businesses, since these cards did represent the most profitable business model and in light of the credit crunch many banks simply dropped secured business credit card programs. There are some good unsecured business credit cards that new businesses with little in the way of a credit record can usually be approved for. These cards tend to be a little on the basic side and often carry a higher APR than some other cards charge but a business credit card can be one of the best ways to build a good credit record so they are still well worth applying for. Here is a little about some of the best unsecured business credit cards that a company with fair to limited credit can obtain. Citizens Bank is a rapidly growing financial institution that began in the Northeast but now has branches all over the US. They are known for the quality of their small business services and this business credit card is no exception. The APR on this card is variable, and will only be revealed to you when you apply but it is typically under 20% which is reasonable for an unsecured fair credit business credit card. In addition a lower APR is offered for the first six months of card membership and there is no annual fee attached to the card. There is a rewards program attached to this business credit card as well, one that earns between 1 and 2 points per dollar spent. Cardholders can however earn up to 20 points per dollar spent when they use their card at “partner merchants”. These include Macys, The Hard Rock Cafe, ADT Payroll Services and AMC theaters. Points can be redeemed for a wide variety of different merchandise, gift certificates and travel rewards. Capital One offers a number of great business credit cards for all credit types but this is the one that those with fair credit are most likely to be approved for. There is no annual fee attached to the card and APR is accessed at 0% for the first six months of card membership and after that a variable APR that can be as low as 14.95%. The Capital One No Hassle Cash business credit card has a cash back rewards program. 1% cash back is awarded on most purchases made on the card and there is no limit to the amount of cash back you can earn and rewards earned do not expire. Cash back is issued automatically at the end of each year unless a card holder opts to do otherwise and in that case cash back can be claimed at any time. Additional benefits include travel insurance, 0% fraud liability, and dining discounts at a number of national eateries and select restaurants. There are several different Chase Ink business credit cards available but the most basic offering, merely called Ink, is the credit card that most small businesses with limited credit should be able to qualify for. There is a 0% APR applied to the card for the first six months and after that the APR will vary from 14.9-19.95 depending on your businesses actual credit profile. 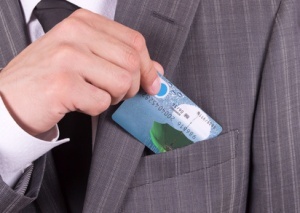 There is no annual fee attached to the card and extra cards for employees are issued free of charge. The Chase Ink card is a cash back unsecured business credit card something that most small businesses will find very useful. Cash back is awarded at the rate of 1% on all purchases. In addition when you first use the card you will receive 10,000 bonus points that can, at any time, be cashed in for a $100 check or statement credit. Cash rewards do not expire however and there is no limit on the amount of cash back that you can earn. The card also comes with travel insurance protection and fraud protection as well as Visa dining discounts. If you have a Chase Ink business card you can enroll in Chase’s Blueprint program, an initiative designed to help businesses get the most out of their credit card with special finance tools and advice. Discover cards have long been known for the great rewards programs they offer but acceptance was once an issue for businesses as Discover was not always as widely accepted as Visa or MasterCard. That has changed over recent years and so now more small businesses are beginning to take advantage of what the Discover Business Card can offer them. The Discover Business Card offers a 0% APR on purchases for the first six billing cycles and a variable 12.99-19,99% APR thereafter. There is no annual fee attached to card. Cashback bonuses offered on the Disorder Business Card are offend at the rate of 5% for all office supply purchases and 2% for all gas purchases but those rewards are capped once $2,000 has been spent in both categories. After those caps have been reached for the year the cash back rate reverts to 1% which is the rate that all other purchases earn cash back rewards and there is no cap on those rewards. You can earn larger cash back rewards of 5-20% by shopping at the online Discover Store which offers products and services from dozens of well known reatilers including Dell, Home Depot, Hotwire Travel Services and Apple. To redeem cash back awards businesses can choose from straight cash back in the form of a check or direct deposit or to increase the value of the points earned by converting them into gift cards from a number of merchants who participate in the Discover store program.